For a smooth and creamy coffee with a subtle sweetness brought to life by the hearty hazelnut, the Hazelnut Cream flavored coffee will sweetly wash over your taste buds. This 100% Arabica bean gourmet coffee features a blast of hazelnuts with a strong and creamy undertone that will indulge you in decadence unlike any other flavored coffee. 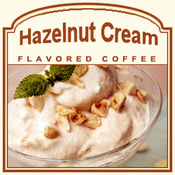 For those that love hazelnut flavors, it doesn�t get creamier and sweeter than this deliciously flavored coffee concoction. With only 2 calories in each cup of this indulging treat, you will fall head over heels! Roasted, packaged, and shipped on the same day, your Hazelnut Cream flavored coffee will arrive fresh- guaranteed! Let the creamy goodness of this ebullient flavor wash over you with each delicious cup!